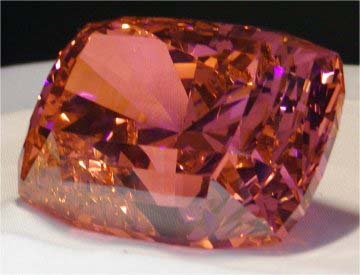 The Dare Devil is a salmon colored cubic zirconia weighing almost 6,000 carats. Cut by members of the Intermountain Faceters Guild, it is believed that this is the largest faceted CZ to date. Salmon in color, the stone flashes red, orange, purple, green and yellow. It is truly awesome. Donated to the AFMS Scholarship Foundation, the Dare Devil was raffled with all proceeds going to the Foundation for use in future scholarship grants. Drawing for the stone occured at the AFMS Convention on July 20, 2002.